Will these changes free the NHS to deliver improved services for patients, or is it a recipe for anarchy which will lead to an explosion of private healthcare provision? These proposals recently announced by Health Secretary, Andrew Lansley are already polarising opinion. At the moment there are far more questions than answers, so PMGroup have brought together a number of experts to discuss the implications of these proposals, and to discuss the questions that are at the front of your minds. We often hear patients report a lack of ‘connection’ with their physician, and where lifestyle plays a role in the development of a disease, such as obesity or type 2 diabetes, patients may even feel the doctor blames them for their condition. Join Cello Health Insight and Pharmaceutical Market Europe (PME)’s webinar to hear an expert discussion of these issues and the consequences for the patient, the patient-physician relationship and for pharma. As medicines access evolves and pharmaceutical companies take an increasingly nuanced approach to it, it’s ever-more important to focus on particular aspects of this area and investigate whether firms are operating optimally. To do this Inceptua Medicines Access and patient group, HAEi, in association with PMGroup, will host a free webinar on Thurday 14th December that will cover both the pre-approval access to medicines and the importance of putting patients at the heart of drug development and access. There are a number of factors at play within the world of medicines access: from industry who need to navigate requests for their pre-approval and unlicensed medicines, to healthcare professionals who are looking for options for their patients and ultimately to the patients and patient advocacy groups who are more empowered than ever and are driving for more timely access to treatments. Today’s healthcare, political and regulatory environments burden have generated a rapid, increasing and significant expansion in the need for access to these medicines. Mark Corbett, Executive Vice President at Inceptua Medicines Access talks about the company’s transformative approach to medicines access, designed to rise to the evolving challenges of the environment, offering unsurpassed understanding and insight into the needs of biopharmaceutical companies and healthcare organisations. The healthcare landscape is rapidly changing as it responds to a multitude of well-known issues. Coupled with emerging digital technologies, these drivers are shaping the industry, moving it towards a more sophisticated, outcomes-driven model that demands a new approach. The new world emerging is one in which value is defined, created and evaluated in a very different way, with marketing playing a critical role. On 30 November, EY (a global leader in assurance, tax, transaction and advisory services) in association with PMGroup, will host a free webinar debating the future of marketing in Life Sciences. Is your function fit for purpose? With traditional media moving online, and the era of social media driving stories through the ethernet, never has a ‘story’ been more impactful. On 15th November JPA Health Communications, in association with PM Group, will debate how a powerful, personal story can surpass facts and figures to create change in a way even the ‘storyteller’ could not have imagined. McCann Health partnered with McCann Truth Central, the global intelligence unit of McCann Worldgroup, to conduct vital research. On the 19th October, McCann Health in association with PMGroup, will look at the truth they uncover about health. ‘The Truth about Doctors’ the first study in the series, aims to get to the heart of the human under the white coat to better understand what motivates doctors and how we can improve the way we communicate to them. Patient insights aren’t just a ‘nice to have’: they are essential to understand the space where Pharma’s drugs ‘live’. On the 10th October, Cello Health Insight in association with PMGroup, will look at the value of three areas of patient research that provide that ‘must have’ understanding: mapping the patient pathway, patient motivation, and the dialogue between patient and HCP. When new products approach the market the level of demand for them is often exaggerated. However, in the real-world we know healthcare professionals may be less comfortable switching from a familiar product, even when clinical trial data suggests a newer product is superior. So what are we missing? 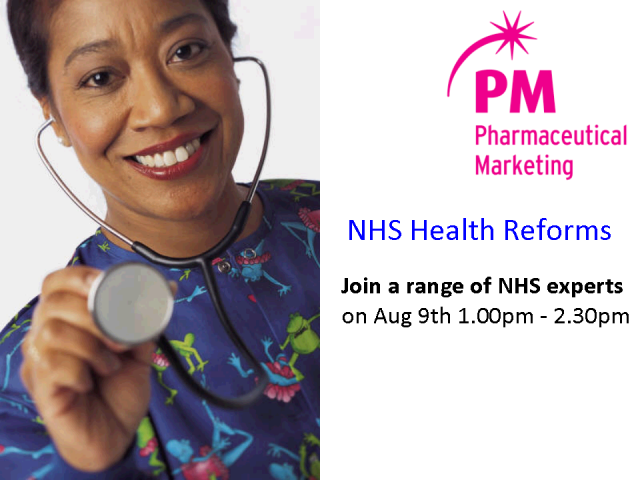 On the 11th July Cello Health Insight, in association with PMGroup, will host a free webinar where we will explore whether ‘regret minimisation’ - an alternative approach that focusses on minimising potential losses - has the potential to offer us new ways to understand the customer behaviour. Everyone in pharma is talking about patient centricity, but how is the drive received ‘on the ground’ among patients who are its focus? How is it unfolding and how far is it being implemented? Do patients even notice it is happening? On the 24 January, Cello Health Insight in association with PMGroup, will host a free webinar which will look to unravel the multi-faceted issue of patient centricity from the patient perspective. What does it really mean for patients and how are they befitting from the initiative? What can market research contribute to our understanding of the current state of play of patient centricity? It is time to take stock and ask ourselves whether the patient-focused activities are benefiting patients and influencing R&D or are they simply a marketing initiative. Involving public affairs early during the development and commercialisation process of a new asset is critical to success when demonstrating value to payers and policy makers. But how can the pharmaceutical industry best support these key stakeholders and the wider healthcare community when it comes to realising the potential of innovation? On Monday 28 November, Cello Health, in association with PMGroup, will host a free webinar on how to reach the tipping point of stakeholder engagement. The webinar will review the ‘total quality management’ model and deliver key learnings, tools and tactics from aligned and well-evidenced programmes that have followed this model. Immuno-oncology therapies that harness the body’s own defences to fight tumours are widely acknowledged as the new frontier in cancer treatment, but until recently only a few products had reached the market for a limited number of indications. Over the past 12 months several new products have been approved for a wider range of tumour types and with pipelines boasting numerous other products in the area, competition looks set to hot up. On November 17 Research Partnership, in association with PMGroup, will host a free webinar which will explore the key features of the immuno-oncology market and the critical success factors for remaining competitive. I would like to invite you to register for the webinar - either to watch it live on the day or for access to a recorded version. Most life sciences companies know they need to move their multichannel marketing forward, but that requires managing a greater volume of tactics that need to be developed, approved, implemented, and measured. And of course, those tactics must reflect how their target audiences engage in content – such as the 65% of healthcare professionals who say they prefer clinical summaries. To truly transform the commercial model, companies must have a strategic blueprint that combines business objectives with brand goals to determine the appropriate resource levels and channel attribution. Commercial analytic solutions are becoming more and more common within the Pharma industry. Companies are spending millions implementing tools which are aimed at helping users identify opportunities to improve the bottom line, segment customers, track multichannel campaign success and meet a myriad of other objectives. Despite all the 'perceived' value these tools can add, they remain largely unused. Excuses for the lack of adoption are varied but can generally be classified into one of three areas - they are either too complex, it isn't convenient to use or it just doesn't deliver on the value promised. These issues are compounded by the fact that they are generally only identified when the solution has been deployed and expected to be used. By ensuring that these issues are addressed at all stages during the development and not just when adoption targets are not being met, commercial analytic solutions can be exploited to attain the anticipated value and more. Traditional models of cognitive behaviour remain meaningful, but they can fail to deliver strong links between ‘smart’, cognitive-based factors of judgement and the decision-making associated with actual behaviour change. In contrast, behavioural economics accounts for the ‘lazy’ judgments and thoughts that occur at an automatic level, but can over-weight the prevalence of such behaviour. On October 4 Cello Health Insight, in association with PMGroup, will host a free webinar on applying adaptive and integrated behavioural models to qualitative enquiry. It will look at how to achieve a better understanding of what drives therapeutic decision-making and how medical marketing, digital and PR initiatives can change future behaviours in favour of achieving target sales. In today’s multi-stakeholder environment, pharma companies need to coordinate their stakeholder interactions between functions to ensure consistency of message and efficiency of cost. The patient journey can be at the centre of this drive by shaping an aligned communication on ‘value’. On 14 September Executive Insight, in association with PMGroup, will host a free webinar about how to leverage the patient journey to strengthen market access deliverables. It will investigate how to develop a common value story, what such a framework should look like and the role of cross-functional working when it comes to putting these ideas into practice. Linking the clinical benefit of a product to a real-world benefit that markets care about, insurers will pay for and that will improve patients’ lives is critical for pipeline assets to succeed. On July 13 Cello Health, in association with PMGroup, will host a free webinar on the value of early asset development and commercialisation. It will follow the asset development journey, defining value from both a financial and clinical perspective, and look at the variables with which companies must contend in order to optimize a product’s prospects. As pressure mounts on the pharmaceutical industry to demonstrate a tangible and positive impact on patients’ lives, understanding barriers to specific clinician behaviours is key to achieving measurable change in clinical practice and advancing patient outcomes. Medical education has the potential to affect a significant number of healthcare professionals’ (HCPs) clinical practice and so improve patients’ outcomes. Nonetheless, achieving these goals requires medical education to move beyond didactic message delivery - that only improves HCPs’ awareness - to using many multi-channel educational interventions to drive real behaviour change. In this webinar, Lucid will discuss why, as an industry, we should all be moving beyond our internal goals to think about how we can improve patient outcomes with all our programmes and share a process for creating measurable improvements. In recent years pharma has slowly been realising the importance of customer experience and the fact that the commercial model that served it so well for the past 30 years might not be the right one for the future. But continued ‘evolution’ is no longer acceptable - a more revolutionary approach to customer engagement design that makes it easy for front line employees to engage andmakes it relevant and unique for the customer is needed before it is too late. On 19 May EY, in association with PMGroup, will host a free webinar on customer engagement design in pharma and time to move beyond the rhetoric, and I would like to invite you to register for it - either to watch it live on the day or for access to a recorded version. Companies developing new rare disease treatments face several unique challenges when it comes to their regulatory and reimbursement submissions. One of the most pressing of these is the paucity of information on patient populations, disease progression and appropriate Clinical Outcome Assessments (COAs), which form an important part of assessing signs and symptoms of rare diseases and treatment response. Recent global survey data confirms that pharmaceutical sales representatives are still doctors’ preferred source of pharmaceutical product information. Although doctors are increasingly using social media and other online channels in their professional capacity to search for and share information, face-to-face interactions still carry more trust and are more likely to influence prescribing. While pharma shouldn’t neglect digital channels as potentially valuable entry points for the promotion of assets, more meaningful and impactful marketing strategies will be those that pursue an optimal mix of face-to-face and digital initiatives.